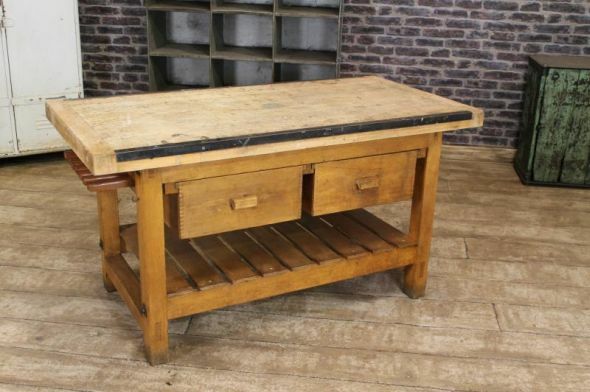 This vintage kitchen island is a fantastic addition to our large stock of vintage and industrial themed furniture. This useful and extremely sturdy beech and pine vintage kitchen island work station features four useful drawers (two to either side), and a slatted shelf section to base. The drawers and the slatted base provide a useful storage solution for any kitchen, and really make a great feature. The item has angle irons to both sides, and would have originally been used as a work bench. It has recently been acquired from a local clearance where it has been adapted and used in a family kitchen on a daily basis. This vintage kitchen island is a lovely item for any country kitchen or vintage interior. We stock a wide range of furniture and crates which would complement this kitchen island beautifully. Please see our other listings or contact us on 01543 375872 for more information.